We agree on something at last Yet many atheopaths are still furiously defending this, as I show below. but this argument is not 20 years old. It is more like 120 years old, having been made by Helmholz in the nineteenth century. Are you sure? Dawkins’s book The Greatest Show on Earth cites Helmholtz extensively on alleged eye faults, and I respond in The Greatest Hoax on Earth? and indeed addressed Helmholtz in my previous work By Design. But Dawkins gives the impression that his “backwardly wired” argument would have strengthened the hand of a “latter-day Helmholtz” armed with current knowledge. But I am also surprised that both he and Dr Sarfati have not addressed the real reason that the layers of the retina are ordered the way that they are. The arrangement derives directly from the embryological origin of the retina as an outgrowth of the developing brain – the order of the layers is fixed long before the eye functions as an optical instrument. We are discussing different types of explanation for something. The above expresses the means of producing the structure, not the reasons the structure is this way. It is like saying that the reason a car’s cylinder and piston are shaped the way they are is that molten metal inevitably follows the shape of a die, and the resulting solid metal is worn away by harder materials of the lathe’s and borer’s cutting implements. To use the Aristotelian terminology of causes, this would be the efficient cause of the car’s engine components, i.e. that which produces or effects a result, and that is what you have described about the eye. But the final cause—the purpose, end, aim, or goal of something—of the car’s components, is a machine to convert the chemical energy of fuel into motion. Or, take a fancy boat-shaped shaped chocolate cake: the efficient cause of the shape is the way liquids (the batter mixture) follow the shape of the container, and the flavour permeating the cake is caused by diffusion from higher concentration to lower. But the final cause explaining why the cake is shaped and flavoured that way is that it’s your son’s birthday and he likes boats and chocolate. Similarly, the final cause of the eye is vision. There is no reason that the efficient cause should be classed as “the real reason”, as you are doing, when it is only one of the four Aristotelian types of cause. The point that Dawkins makes explicitly, and that Sarfati has apparently failed to appreciate, is that what would appear to be a drawback in design is well compensated for by numerous adaptations that have arisen during the evolution of the eye. Indeed, that was the excuse of theistic evolutionist Ken Miller (see also refutations of his anticreationist books Finding Darwin’s God and Only a Theory). But this begs the question of whether this “backward wiring” really was a drawback at all. All we have is assertion, as well as appeals to ‘common sense’, which is sometimes not a reliable guide. Without the “backward wiring”, there would have been no Müller cells acting as light guides, filtering out scattered light and non-visible wavelengths and reducing chromatic aberration. Because these improvements and compensations are applied to a structure whose basic layout is “locked in” by its evolutionary heritage, all vertebrate eyes have the “backwards retina” in common. This arrangement underlies all of the various adaptations and is not due to “the need to regenerate the photocells” as Dr. Sarfati claims. Not just me, but ophthalmologists Dr George Marshall and Peter Gurney. Yet as I note in my previous article: the computer simulation he touts as proof for eye evolution starts with the nerve behind the light-sensitive spot. The vertebrate eye has the nerves in front of the photoreceptors, while the evolutionary just-so story provides no transitions from behind to in front, with all the other complex coordinated changes that would have to occur as well. Not going to happen, given that you presuppose evolution to argue for evolution. Since the retina is now called ‘an optimal structure’ by experts in the field, precisely because of the ‘backward’ wiring, it utterly fails as an argument from ‘bad design’. And now to another critic—the self-described “godless liberal” P.Z. Myers. Readers will remember how he attended a Global Atheist Conference but wimped out of a debate, instead replying with the crudeness of a hyperhormonized government school teenager. On his gutter atheopath blog, he shows that he’s still blind to the obvious flaws in his and Dawkins’ argument: since the retina is now called “an optimal structure” by experts in the field, precisely because of the “backward”wiring, it utterly fails as an argument from “bad design”. Much of Myers’ argument is similar to that of Richard M.’s in the above feedback, but more crudely expressed: again presupposing evolution to be true—since it’s a vital crutch for his atheistic faith—and then explains away how this supposed bad design becomes “an optimal structure”. First, there’s a stereotype he’s playing to: he’s trying to set up a hierarchy of superior vision, and he wants our god-designed eyes at the top, so he tells us that most cephalopods have poorer vision than we do. He doesn’t bother to mention that humans don’t have particularly good vision ourselves; birds have better eyes. So, is God avian? First, in my article, I said, “it is no accident that we say ‘eyes like a hawk/eagle’”, hardly the words of someone trying to hide good avian vision. I’ve also pointed out that humans are worse flyers than birds, but no, God is not avian—I guarantee that no bird will be discussing this article, for one thing. Also, they have never shown that cephalopods actually see better. On the contrary, their eyes merely ‘approach some of the lower vertebrate eyes in efficiency’ and they are probably colour blind. Moreover, the cephalopod retina, besides being ‘verted’, is actually much simpler than the ‘inverted’ retina of vertebrates; as Budelmann states, ‘The structure of the [cephalopod] retina is much simpler than in the vertebrate eye, with only two neural components, the receptor cells and efferent fibres’. It is an undulating structure with ‘long cylindrical photoreceptor cells with rhabdomeres consisting of microvilli’, so that the cephalopod eye has been described as a ‘compound eye with a single lens’. The rhabdomeres act as light guides, and their microvilli are arranged such that the animal can detect the direction of polarized light—this foils camouflage based on reflection. Finally, in their natural environment cephalopods are exposed to a much lower light intensity than are most vertebrates and they generally live only two or three years at the most. Nothing is known about the lifespan of the giant squid; in any case it is believed to frequent great depths at which there is little light. Thus for cephalopods there is less need for protection against photic damage. Being differently designed for a different environment, the cephalopod eye can function well with a ‘verted’ retina. God is not avian—I guarantee that no bird will be discussing this article, for one thing. It’s interesting that some friendly as well as hostile feedback questions questioned whether cephalopods lack colour vision, yet Myers affirmed that they are colour blind, including cuttlefish, with the possible exception of a firefly squid. But then he calls colour vision a compromise, since it doesn’t work in dim light, although given its many advantages, it looks like he is still finding excuses to cling to his atheism. He fondly imagines that I am bothered by this. Yet I’ve written on the amazing eyes of other creatures, including the mantis shrimp, with 12 colour receptors. Much of my previous book By Design is about fascinating designs in the living world apart from humans. After all, God called his whole creation “very good”, not just humans. But as shown before, Myers is clueless about what creationists really believe, most likely willfully so (see also Evolutionary equivocation: My brush with P.Z. 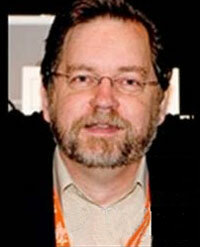 Myers at his anti-creationist talk in Minot, ND, by Greg Demme), just like his hero Dawkins. Note again that the critics like Dawkins, Miller and Myers have no qualifications in ophthalmology or spectroscopy, while I am an expert in the latter, and cite experts in the former (Drs Gurney and Marshall above). Abstract: Vision starts with the absorption of light by the retinal photoreceptors-cones and rods. However, due to the ‘inverted’ structure of the retina, the incident light must propagate through reflecting and scattering cellular layers before reaching the photoreceptors. It has been recently suggested that Müller cells function as optical fibres in the retina, transferring light illuminating the retinal surface onto the cone photoreceptors. Here we show that Müller cells are wavelength-dependent wave-guides, concentrating the green-red part of the visible spectrum onto cones and allowing the blue-purple part to leak onto nearby rods. This phenomenon is observed in the isolated retina and explained by a computational model, for the guinea pig and the human parafoveal retina. Therefore, light propagation by Müller cells through the retina can be considered as an integral part of the first step in the visual process, increasing photon absorption by cones while minimally affecting rod-mediated vision. I’m always fascinated by the discussion of the eye’s function and design, and much even in this article was new to me (not that I fully remember, or even comprehend, every detail of the others). 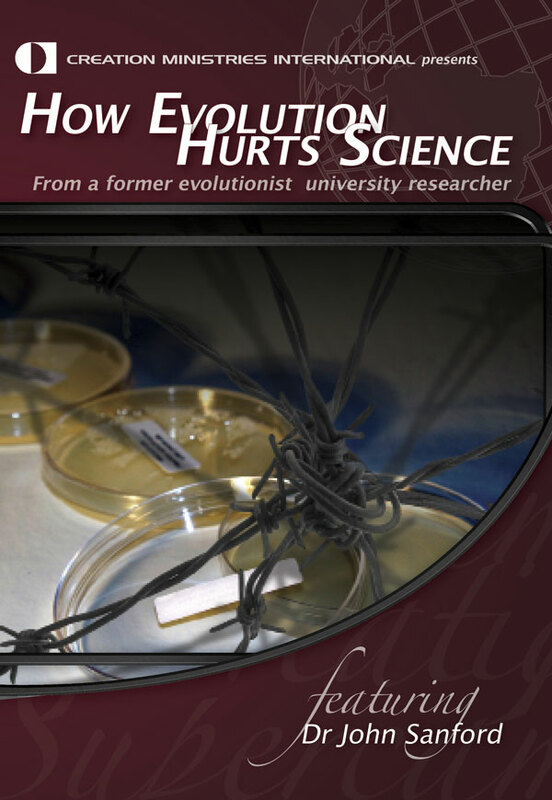 A while back, I was debating an evolutionist online, and he brought up the subject of the eye’s “backward wiring.” I quoted from another creationist article on the eye, and his response was a vague “You don’t understand evolution,” or something to that effect. I responded again, and his response was “[Expletive] you!” My final comment was brief: “The last refuge of the intellectual loser.” Perhaps it was harsh, but it’s amazing to see clear evidence for Creation completely dismissed, even without a refutation (and of course my comment wasn’t as harsh as his was to me). Please send a copy directly to Dawkins for his comments. He would however probably ignore it. 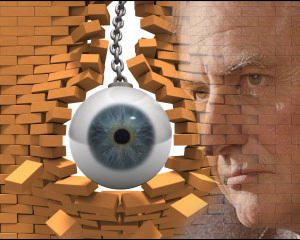 Regarding Dawkins’ quote regarding the fact our eyes see very well, “It is good because natural selection, working as a sweeper-up of countless little details, came along after the big original error of installing the retina backwards, and restored it to a high-quality precision instrument.” If natural selection is able to come along and sweep up all the flaws, why didn’t natural selection just select the “right way” in the first place? Then it wouldn’t have to sweep up the flaws. If “Natural Selection” was actually able to select in view of a goal then it must have selected the way it is and did not select Dawkins’ version of the flawless eye. If there is no God, how can he criticise the eye’s design since it would be the result of natural selection? May the Lord continue to bless your ministry! 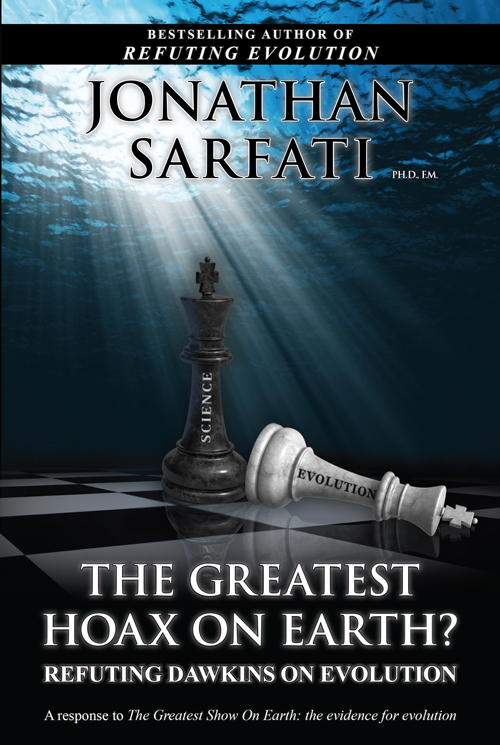 Jonathan Sarfati checkmates Dawkins once more: his Greatest Hoax is a revelation! Truly a latter-day David felling a worldly Goliath. 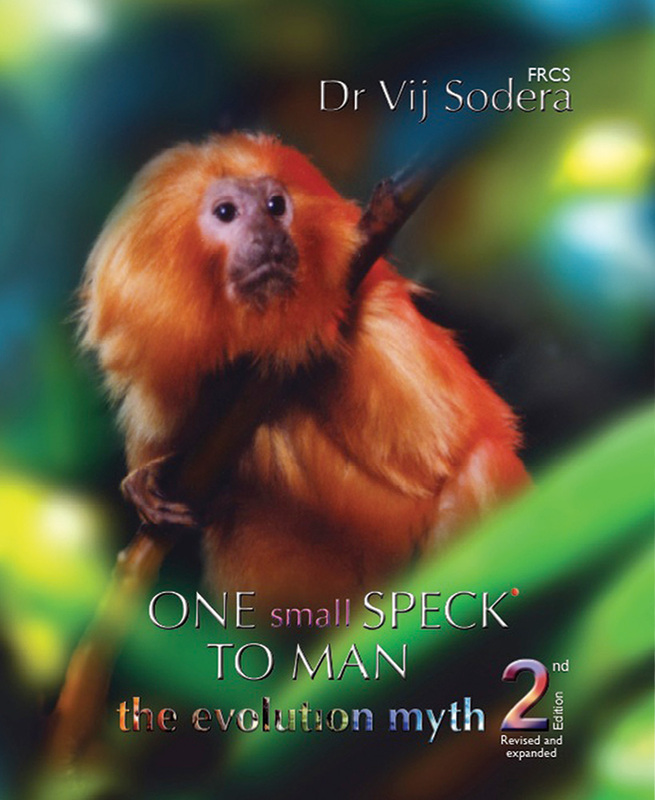 The sum total of these articles expose the Darwinists for the humbugs that they are. I do give Richard Dawkins credit for trying to carry on a debate with creationists even though he loses both on stage and in the battle of books. Hoax is an outstanding read and covers in detail the workings of the eye in a way that the layman can understand it. 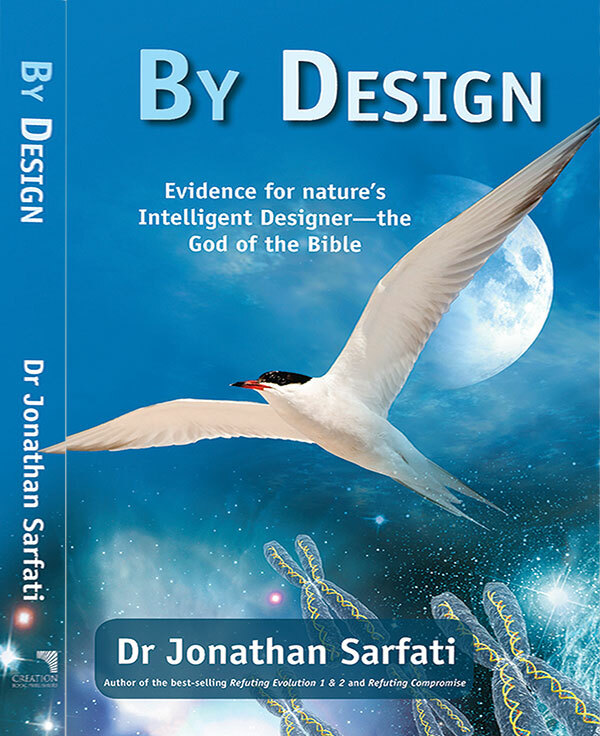 After reading the book I cannot imagine that Dawkins or Myers would now debate Dr Sarfati. They would have a better chance taking him on at chess! Richard Dawkins the ‘Apostle of Atheism’: how can he be answered? What about claims of ‘bad design’? Mollusks, Encyclopædia Britannica 24:296-322, 15th ed., 1992; quote on p. 321. Return to text. Hanlon, R.T., and Messenger, J.B., Cephalopod Behaviour, Cambridge University Press, Cambridge, New York, p. 19, 1996. Return to text. Budelmann, B.U., Cephalopod sense organs, nerves and brain, 1994. In Pörtner, H.O., O’Dor, R.J. and Macmillan, D.L., ed., Physiology of cephalopod molluscs: lifestyle and performance adaptations, Gordon and Breach, Basel, Switzerland, p. 15, 1994. Return to text. Sensory Reception, Encyclopædia Britannica 27:114–221, 15th ed., 1992; quote on p. 147. Return to text. Budelmann, Ref. 3, p. 15. Return to text. The Greatest Hoax on Earth?